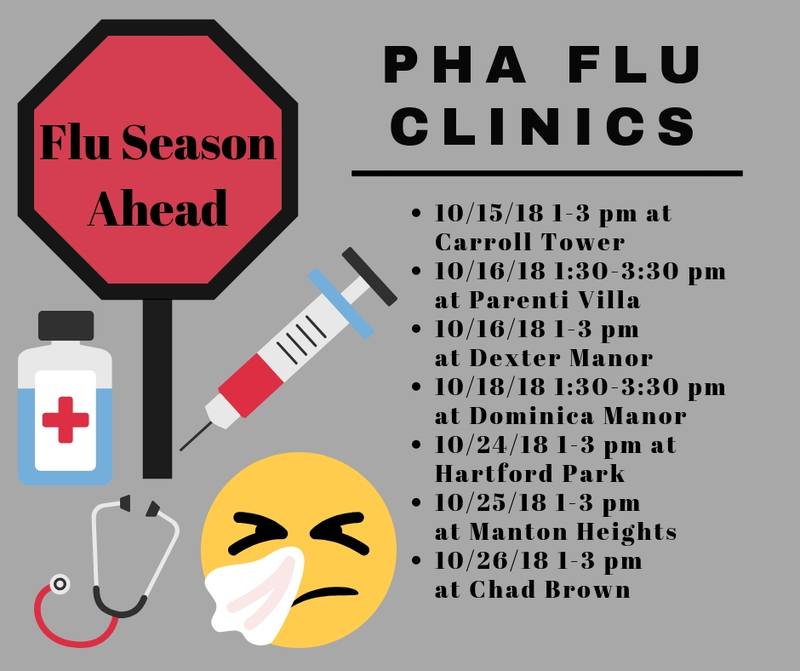 According to the U.S. Centers for Disease Control and Prevention (CDC), “the single best way to prevent seasonal flu is to get vaccinated each year.” The Providence Housing Authority (PHA) has partnered with Lifespan and Walgreens to host flu shot clinics at our elderly high rises and will also host health fairs at all family developments throughout the month of October. New immunizations for influenza (flu) are created every fall and are recommended for everyone older than 6 months. While the vaccine cannot give you the flu, there can be some mild side effects including achiness, low-grade fever, and soreness around where the shot was administered. It takes approximately 1-2 weeks for the vaccine to become effective. Free flu shots will be available at all sites during the times listed below. Flu season typically begins in October but peaks in January and February. The season can be unpredictable though so it is worth vaccinating early and remaining vigilant about hand washing and other healthy habits (see below for more healthy habits to stop the spread of germs). Avoid Close Contact – maintain a safe distance from people who are sick and if you are sick help prevent the spread of germs by keeping your distance. Stay Home – often times families do not have employers that allow sick leave so staying out of work is not an economically viable option but ideally, if you are sick, you should stay home from work, school, and general errands to avoid spreading the germs to others. Cover Your Mouth – we’ve heard our moms say it time and time again but covering your nose and mouth with a tissue when you cough or sneeze really can prevent the spread of serious airborne illnesses. Wash Your Hands – another one we’ve heard again and again. Soap and water or alcohol-based hand sanitizer are the keys to flu prevention. When washing, remember CDC advice to “wet, lather, scrub, rinse and dry”. Avoid Touching Your Face – especially your eyes, nose, and mouth. Housekeeping – cleaning and disinfecting commonly touched spaces regularly helps kill germs and prevent their spread throughout a house or work space. Other Healthy Habits – getting plenty of rest, managing stress, drinking fluids, eating well, and being physically active all help ensure you remain healthy during flu season. To learn more about the flu clinics or health fairs hosted by the PHA, please reach out our Resident Services Department or the Resident Service Coordinator at your development.